On April 8, 2014, Microsoft is officially retiring Windows XP and Office 2003. As Windows XP comes to the end of its life, desktops and servers all around the world will feel the effects. Microsoft recently estimated that 25% of all Microsoft operating systems in use today are still using Windows XP! Fortunately, there are a couple things you can do if your applications depend on Windows XP. 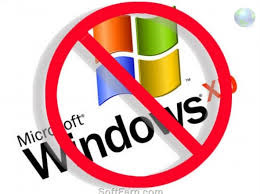 With Windows XP's retirement party less than 90 days away, after April 8 any zero-day exploit released into the wild will run rampant on Windows XP systems while Microsoft watches on the sidelines; they will not offer any security patches to mitigate the security risk. When companies beg for a security fix, Microsoft will hold one document up: the lifecycle information for Windows XP with a Post-it note that shows we all had four years to move to Windows 7, to avoid a Windows XP exploit. I am writing this blog to make certain my readers are well aware that you are quickly running out of both time and options when it comes to removing Windows XP from your company. Microsoft isn't the only company ditching XP. Not only can Microsoft wash its hands of Windows XP support, but so can all the custom software and Line-of-Business application companies that once supported Windows XP. Assuming those companies stopped actively developing for the Operating System years ago, they are likely still supporting the applications that run on it. After Windows XP end of life on April 8, 2014, they'll have no reason to continue to support that version of their software. The implications of this reality run far and wide. Line-of-business software is surely affected, as are any other random software applications you are using. Honestly, when was the last time you called any support company regarding Windows XP? It’s not that you will no longer be able to call and get technical support from Microsoft that really matters. What really is cause for concern is that Microsoft and security software vendors will likely stop patching, updating and supporting their software. Why would companies such as McAfee, Symantec, Kaspersky or Trend Micro bother maintaining a product for an Operating System that is, for all intents, dead? Windows XP will still run, and it could be that their definition files will be updated with the latest viruses for a time, but do you think those companies will pay attention to viruses targeted toward XP after its retired? I think it is unlikely! The bottom line is that running Windows XP in your organization on anything other than a desktop with no network connection, no floppy drive, no USB ports, or CD drive is an outright liability, bordering on irresponsible; you must insure that the machine cannot be attacked by any virus. Yes, there will be some unique software situations that will require it, but if you determine that your organization can't afford to get off Windows XP on the basis of support or cost, I believe you are wrong. Let me be clear -- I love Windows XP; I distinctly remember running Windows XP on my early IBM AT computer with an AT-style keyboard. Still, it's now past the time to put Windows XP out to pasture. There is at least one thing you can do, though, to extend the life of systems that depend on Windows XP: use a Windows Server 2003 R2. Windows Server 2003 R2 is essentially Windows XP Server, and while the Windows XP end of life date is April 8, 2014, the end of life for Server 2003 R2 comes 15 months after that: July 14, 2015. Since they are roughly the same OS, based on the same kernel, it's likely that anything you require XP for will work on Server 2003 R2 -- and that will buy you more than a year to figure things out. The bottom line is that you're running out of both time and options when it comes to removing Windows XP from your company. But, whatever you do, make sure that Windows XP is off your network by April 8 2014. If you would like to learn more about what your next steps as a business owner should be; sign up for my 30 minute educational webinar below.